I highly doubt it, I think it's a G45 with a G17 slide, albeit with the ubiquitous hole in the bottom of slide, ala G34 / G48, when the dustcover end before the muzzle. Because you need a hole there, for some reason. The hole is for the front sight tool. I noticed the long base pads too. I believe that's a result of a survey that was done and that's what agents wanted. So since the front half moon is gone, the basepad has to be long af! Because you need a hole there, for some reason. It’s for a tactical on the fly front sight change. Can you imagine losing a front sight in a firefight and not being able to change it? Terrifying thought. Most importantly; going to 9mm vice 40 (I think some of the BP officers were issued 357 Sig too?). A G17 Gen5 MOS would have been just fine. Basically the same anyways. Then USBP wouldn't feel special. FBI got G19M, Army M17/18-P320, so they needed some love. Well either way I'm glad it's a Glock. I've hated the p2000 since the academy and ive used glocks for uspsa for almost 7 or 8 years so I'm happy. Lots of guys wanted the 320 and some even wanted the CZ p10....sorry guys! This is outstanding! Congratulations. I hope it's the G45 or G17/G19 in the Gen 5. I really feel like Glock has learned from their Gen 4 mistakes. The Gen 5s have been exceptional handguns on our range. Will you let us know what model and duty load when and if you can? I'm personally hoping for 124-grain HST +P! Yeah, it's a solid choice - not that the other options are bad, but it's hard to argue against using Glocks. CZ are reportedly great but I don't see any large US agency adopting them. It's a 17 gen5 mos with a short dust cover. Why? Now it can take that G19 MOS slide, making it a G19/G45 MOS version. I presume that the 47 slide could be mounted on the G19, but it remains to be confirmed. Modularity of components between those guns probably gives five available configurations. Gives you more options and interchangeable parts allow for flexibility in support. Some logistic advantages too - say, an optic on G17 slide fails but you want a full capacity frame; you drop your G19 slide with zeroed optic on it and are ready to go vs having to mount and zero a new optic. Just my thoughts, no official knowledge. I really hope the G47's slide is compatible with the Gen 5 G19. They I can pair a G47 with my G19, and have a G47, G45, G19, and G19L as options. Do you like the P2000? 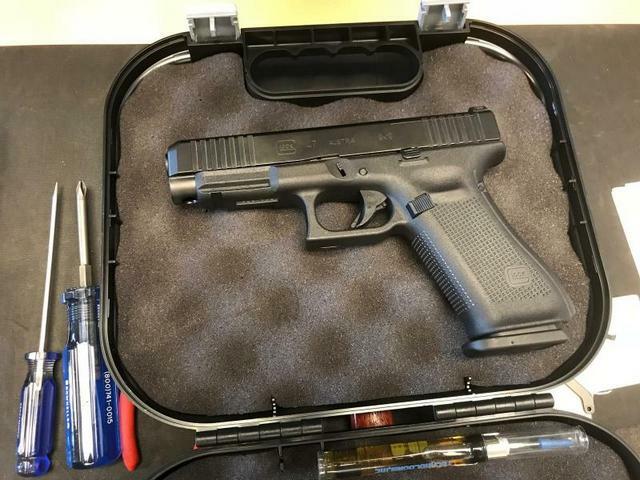 The question keeps coming up - why the Glock 47 instead of a 17 MOS ? The answer is it got Glock an $85 million contract for 60,000 pistols and associated support gear and services. Why / how did it get Glock the CBP contract? 2.3 The family of firearms shall include three variations of sizes, with an emphasis on modularity. 4.2.1 Height: shall not exceed 6.00 inches. 4.2.2 Width: shall not exceed 1.50 inches. 4.2.6 Modularity: Frame must also be compatible with slide/barrel combination from pistol #2 without adversely affecting functionality and operations of the firearm. 4.3.2 Width: shall not exceed 1.50 inches. 4.3.6 Modularity: Frame must also be compatible with slide/barrel combination from pistol #1 without adversely affecting functionality and operations of the firearm. Shall accept full size magazines (Pistol #1) without adversely affecting functionality and operation of the firearm. 4.4.2 Width: shall not exceed 1.50 inches. 4.4.6 Modularity: Compatibility with slide/barrel combination from pistol #2 without adversely affecting functionality and operations of the firearm is preferred but not required. Shall accept full size and mid-size magazines (Pistol #1 and Pistol #2) without adversely affecting functionality and operation of the firearm. Like the proverbial Camel, the G47 is a horse designed by committee. It is part of a system of guns including the G19 MOS Gen 5 and the G26 Gen 5. I personally have no desire to own a G47 as I am hoping for a G45 MOS to be released at NRAAM but the G47 will work just fine for those it is intended for. I really feel like Glock has learned from their Gen 4 mistakes. What's wrong with the Gen 4? That was my thought, too. Finger grooves, maybe? Lots of ppl hated the BTF - mine do it from time to time with cheap range ammo, but never with more hot stuff. The G45 slings brass 15+ feet at 3 o'clock all day long, zero exceptions. It's really remarkable how consistent it is.